Our Buff Orpington ladies are living up to their broody billing. We have several who really want to be mommies. When a hen goes broody, they go through a hormonal change and will do anything and everything to “brood” a clutch of eggs. If you want chicks then this is a good thing. If you just want eggs… not so much. When they go broody they stop laying eggs. They also get kind of nasty and will peck at you whenever try to get the eggs from underneath them. Zina and Aaron went out and started the “break a broody” proceedings. 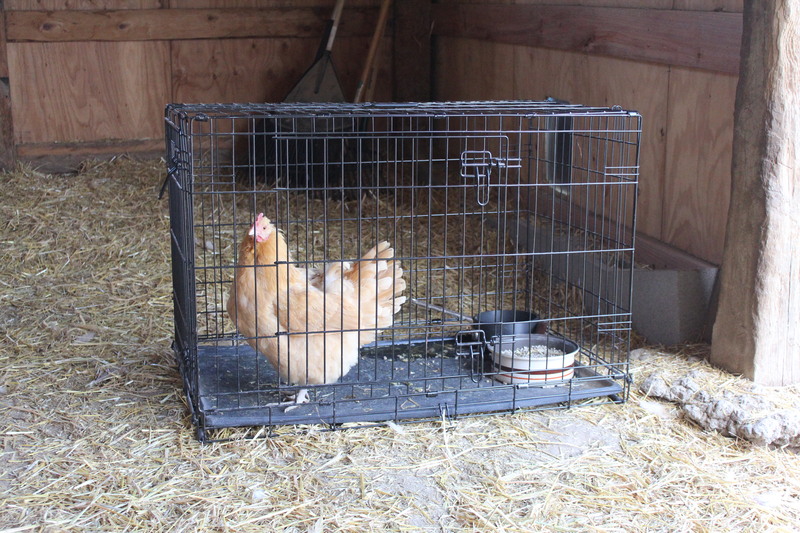 The hen in question gets isolated (we use Basil’s old puppy crate). They essentially need to be put somewhere where there isn’t anything to nest in and will sort of cool off their tummies. This lady was so broody she tried to nest in her pan of food. In about a day or two she will be let out. If she rejoins the flock we are good to go. If she heads back to the nest…. more time out is in order. This entry was posted in JAZ Farm Livestock, The Chickens at JAZ Farm, Uncategorized.